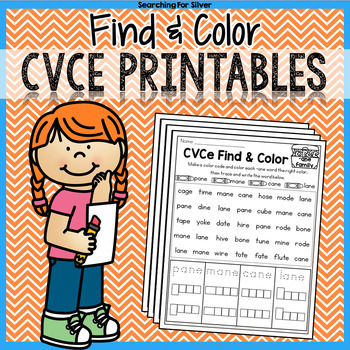 The CVCe activity pages in this packet will help students learn to read, identify, and write CVCe word family words. 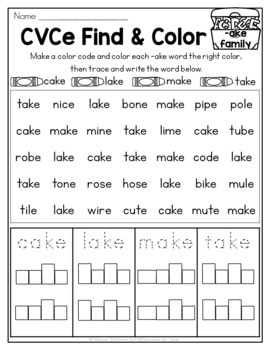 These can be used as a reading center, word work, homework, morning work, or centers. Students will color each crayon on the page a different color. 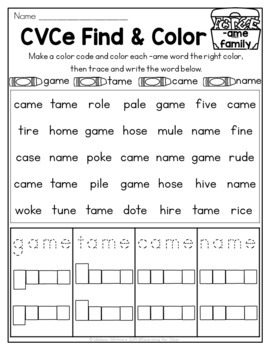 They will use that as a key to identify and color the words in the word search. Then, students trace and write the words below. **If you have a question, comment, find errors or see a need for a technical update to a product, please leave me a message in the “ask a question” section of my store or send me an email at searchingforsilver@outlook.com. **Purchase of this product is for one teacher, one classroom. For multiple classroom usage, please visit the “my purchases” tab and purchase more licenses. Copyright © Melanie Whitmire 2019 @Searching for Silver-All rights reserved by the author. Purchase of this item entitles the purchaser the right to reproduce the pages for personal or classroom use. Duplication for other classes, an entire school, or commercial purposes is strictly prohibited and is a violation of the Digital Millennium Copyright Act (DMCA). To add additional licenses of this product, see your “my purchases” tab after purchase.